Will an Age of Electric Vehicles Arrive? 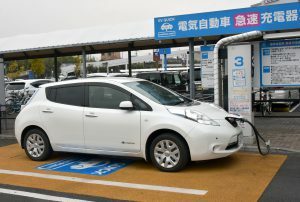 With EVs having only about two-thirds the number of parts that gasoline vehicles have, and automakers that entered the market later having no ties to parts manufacturers, Ozawa emphasizes that China is aiming to “quickly take the lead for EVs.” He mentions a major reason for the accelerated adoption of EVs in Europe is the 2015 diesel-emission scandal by German automaker Volkswagen, after which they announced a shift to increase the ratio of EVs and plug-in hybrid electric vehicles (PHEV) they manufacture from the current 1% to 25% by 2025. Ozawa also mentioned that coal is the main power source in China and India, so although they are focusing on EV research, “If the number of coal power plants is increased in order to supply electricity for EVs, then CO2 emissions could actually increase.” He argued that if the emphasis is environmental friendliness, then the issue of power sources has to be considered as part of EV research.